You’ve probably heard about how green tea is something of a “superdrink”, positively brimming with antioxidants and phytonutrients that support a healthy body and mind. But is there any substance to the claims? And what is it, exactly, that makes green tea so darn magical? In this post, I’ll examine the science behind green tea in more detail. We’ll explore the origins and mechanisms behind how green tea is made, the various beneficial compounds it contains that make it so healthy, and some of the many ways in which it can improve your health and stave off disease. While the history of tea production and consumption dates back thousands of years, it was only around the 8th century A.D. that green tea first emerged on the Chinese market. At this point, tea producers began to realize that by steaming the leaves, they could prevent their oxidation and allow them to maintain their superior taste and nutrient qualities for longer. Green tea actually originates from the same plant as black tea — Camellia sinensis. The difference lies in how the tea leaves are processed — after harvesting, tea leaves intended for black tea production are allowed to oxidize, a process in which oxygen interacts with the cell walls of the leaves, turning them the characteristic black or dark brown color. This changes the flavor of the leaves, but allows black tea leaves to retain their distinctive flavor and aroma for longer — a big plus for the tea trade back in antiquity! Leaves intended for green tea production, on the other hand, are steamed immediately after harvest in order to prevent oxidation. While this means that the leaves don’t last as long as black tea, it also means that they retain more of their nutrients and provide a lighter, fruitier flavor. It’s this gentle steaming process that locks all the wonderful antioxidants into green tea leaves, ensuring that a fresh brew of green tea truly is a superdrink! Okay, so you know that green tea is loaded with antioxidants. Big deal — lots of other foods and drinks do as well, right? What’s all the fuss about then? When it comes to green tea, the secret is in the catechins. Catechins are particularly potent antioxidants that protect our cells against damage and aging, encourage healthy neural activity, and support a wide range of critical functions in the human body. It’s these antioxidants, and one in particular called epigallocatechin gallate (EGCG), that make green tea a cut above the rest. Here are some of the many reasons why you should consider trading your morning coffee for a morning cup of green tea. In a study published last year, researchers divided mice into three groups: a control group fed a standard diet, a group fed a high fat, high-fructose diet and a group fed a high-fat, high-fructose diet supplemented with two grams of EGCG (that critical catechin found in green tea) per liter of drinking water. Over the course of 16 weeks, the research team monitored how the mice responded to their various diets. During that time, they noticed that the mice fed with EGCG spent more time in the target quadrant of a maze test, and were more likely to use platform crossings in a water test. Scientific mumbo-jumbo? Certainly. The meaning? That the catechins found in green tea can protect memory against impairment at the hands of a diet very similar to the average American diet. In the same study referenced above, researchers also found that supplementing with the antioxidants in green tea lowered the amount of weight put on by mice fed a high-fat, high-fructose diet. This is actually nothing new to the scientific world, with multiple studies showing a strong link between drinking green tea and weight loss. A 2008 study, for example, also showed that mice on a high-fat diet who supplemented with EGCG put on less weight and had decreased blood glucose levels when compared to mice on a high-fat diet alone. Another study found that the catechins and caffeine found in green tea had synergistic anti-obesity effects, and along with the theanine in green tea could help to significantly lower body weight. The cancer-fighting abilities of green tea are almost a thing of legend, with study after study proving that the antioxidants in green tea can protect against a wide range of cancers. A 2014 study, for example, showed that the polyphenols in green tea helped to delay breast cancer progression and invasion. Other research shows that green tea can protect against oral, esophageal, stomach, colon, lung and liver cancer. And the key player behind all these anti-cancer effects? Why, none other than EGCG, of course! Green tea contains caffeine and L-theanine, two compounds that have been shown to boost brain function. 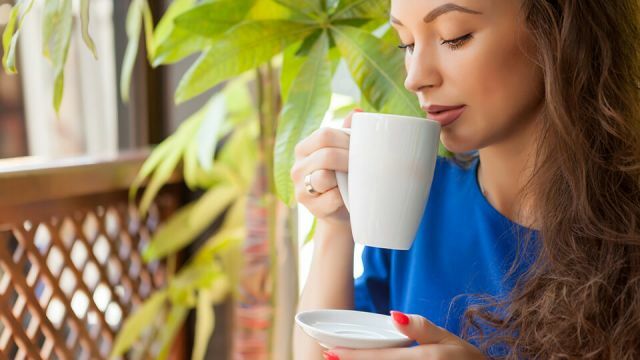 While green tea doesn’t contain nearly as much caffeine as coffee, it has enough to produce a beneficial response in the brain while avoiding those caffeine “jitters” that coffee drinkers sometimes suffer from. Caffeine works by inhibiting the action of neurotransmitter-blocking adenosine, thereby improving concentration and boosting neuronal activity in the brain. At the same time, the L-theanine in green tea works synergistically with caffeine to heighten brain function and improve mental clarity. L-theanine has been shown to promote “alert relaxation” — a state in which the mind functions much more effectively with the weight of anxiety temporarily lifted. The heart-supporting effects of green tea are virtually legendary. A 2006 study showed that drinking green tea improves endothelial function, lowers blood pressure, and protects against myocardial injury. Another study found that green tea polyphenols like EGCG helped to lower blood pressure increases in stroke-prone individuals, and concluded that simply drinking green tea on a regular basis can help to protect against hypertension. It’s no wonder green tea is the second most consumed beverage in the world (second only to water). Suffice it to say that making the switch to green tea is a very healthy choice indeed! Hey Buddy!, I found this information for you: "Drink This Tea Every Morning To Improve Memory, Fight Obesity And More". Here is the website link: https://www.thealternativedaily.com/drink-green-tea-every-morning-to-improve-memory-and-fight-obesity/. Thank you.